Christchurch is known as the Garden City of New Zealand and lives up to its name by hosting an abundance of parks and gardens, scattered throughout and around the city. Situated on the east coast of the South Island, Christchurch is the largest and most prominent city of the Canterbury region. It is also arguably one of the most attractive cities in New Zealand as it is surrounded by pleasant mountains, ocean beaches, rivers, lakes and wide-open spaces. The city itself is home to a large collection of historical, gothic architecture, with the Christchurch Cathedral and Canterbury Museum some of the city's cultural highlights. Christchurch is a must-see when visiting the South Island and is truly a sight to behold! Kaikoura is a seaside settlement, nestled on the rugged coast of the South Island, between Christchurch and Picton. This picturesque village is overlooked by majestic mountains that are snow-capped throughout many months of the year. The town enjoys pleasant contrasts between coastal and mountain settings and is home to an abundance of eco-tourism oriented activities. While visiting Kaikoura, most people choose to venture out on a cruise and watch the whales, or if they are there at the right time of year there are also opportunities to swim with the seals and dolphins. Kaikoura is also home to some amazing coastal walks, which allow you to soak up the spectacular surrounds and breathe in the fresh sea air! The Marlborough Region in the north east of the South Island is home to the quaint town of Blenheim. The town exhibits a relaxed lifestyle and a flourishing wine and gourmet food industry. The actual town itself is flat and is still considered a tectonically active zone, with mild earthquakes occurring several times a year. Blenheim is also known as the 'sunshine capital of New Zealand', enjoying sunshine practically all year round. This makes it a perfect place to visit and take part in fun activities such as visiting the open-plan zoo and white-water-rafting the Wairau River. Blenheim is the ideal place to base yourself for the exploration of all the surrounding wineries. There really is something here for everyone and you are sure to want to keep coming back for more! The settlement of Picton is a small seaport at the head of the Queen Charlotte Sound, in the South Island's Marlborough region. The town enjoys a relaxed setting and laid back lifestyle and is the perfect place to escape to for relaxation and to get back in touch with nature. The town features beautiful beaches and bushwalks and benefits from a pleasant climate all year round. Its location right on the waterfront, on the Marlborough and Queen Charlotte Sounds' means that there are excellent opportunities to swim with the dolphins and or kayak on the open ocean. A visit to Picton is the perfect excuse to get back in touch with nature and discover your inner soul. Take some time to discover the wide open spaces, beaches, lakes, national parks and unique landforms of Nelson. The streets are lined with gourmet cafes, artists and galleries and boutique shopping experiences. Nelson enjoys an irresistible blend of lifestyle and stunning landscapes that make this town a creative paradise. The economy thrives on the seafood, horticulture, tourism and forestry industries, which makes it an ideal tourist resort for all ages. There is something in Nelson to suit all needs and tastes and you will be guaranteed to never want to leave! Takaka is a small town situated in the south-eastern end of Golden Bay at the north end of New Zealand's South Island. The quaint village is nestled on the banks of the Takaka River and runs up onto Takaka Hill. This bohemic retreat is a region of wildlife, forests, arts and attitudes and is the perfect place to relax, take it easy and enjoy the peaceful surrounds. Its close proximity to the Abel Tasman National Park makes it the idyllic base for exploration of this natural wonderland and the surrounding areas are also notable for their cave systems, which will add to your nature experience. New Zealand's deepest shaft, Harwood's Hole is located within a short driving distance and this is simply a must-see when visiting the Takaka area. Takaka offers a unique experience of nature that you simply cannot pass by! This port town is the largest centre on the Northern west coast of the South Island. The seaside village is steeped with history, which a visit to the Coaltown Museum will show. Westport is close to the fur seal colony at Cape Foulwind, which is an essential place to visit if you want to experience the uniqueness of these amazing animals. It is also close to many of New Zealand's stunning national parks, with the great Southern Alps creating a pleasant backdrop to the town centre. If the stunning surroundings aren't enough to draw you towards Westport, there is sure to be something else to suit you! Hokitika is the gateway to the West Coast heartland and is the perfect place to experience stories of nature, history and culture. The friendly community will welcome you with open arms and make you feel right at home instantly. The town itself is backed by wild beaches and beautiful rivers and is one of the best hotspots in New Zealand when it comes to recreational activities. The blacksand and pebble beaches are great for walking along and the rainforest walks create perfect hiking routes all year round. The stunning surrounds offer a wealth of experience and will allow you to reconnect with nature. The town of Oxford is a small village with a tranquil rural setting. The settlement is nestled at the base of the Oxford Hills and the Puketeraki Range acts as a pleasant backdrop in the far distance. A visit to Oxford is the perfect way to experience old time New Zealand, with a visit to the Oxford Museum and Jail House highly recommended. The town's close proximity to many outdoor adventure activities makes it the ideal place to spend a few nights on your next New Zealand adventure. Ashburton is the gateway to some of the South Island's best activities and attractions. It is located just as short drive from Christchurch which makes it the perfect place to go to escape the hustle and bustle. The highlight of the area is undoubtedly Lake Hood, a picturesque lake set in beautiful park-like surroundings. This recreational hotspot boasts endless kilometres of coastline, a water ski tournament park and an international class rowing course. This is the perfect destination for watersport lovers and its close proximity to Ashburton makes it popular with the locals and tourists. Art, craft and culture also play a prominent role in the community, with multiple art galleries, societies and craft villages in the town centre. So whether you want to experience a taste of culture or get out into the great outdoors, there is guaranteed to be something for you in Ashburton. The town of Fairlie is part of the Mackenzie District in the Canterbury region of New Zealand's South Island. It is often referred to as the gateway to the Mackenzie Basin as it where a lot of tourists start their exploration of this stunning area. This is also the perfect place to visit if you simply want to soak up some spectacular natural views. Fairlie is situated close to Aoraki Mount Cook and Lake Takapu which are simply stunning natural attractions. The pleasant contrasts of rich, rolling green hills and pastures and a stunning, shimmering upland create the perfect setting that will be embedded in your memory forever. Timaru is the major port city of the Canterbury region and is the urban hub of the central South Island. The area is home to a prosperous agricultural heartland that rests of the hills that were created from the lava flows of the extinct Mt Horrible Volcano. The town itself has recently regained its Edwardian status and features some historical architecture that depicts stories of days gone by. It is also home to a striking piazza, with alfresco cafes and bars lining the seaside streets, soaking up the superb ocean front setting that makes this town so majestic. This is a must-see when visiting the South Island as you will be welcomed and allowed to feel at peace with the land and sea, all in the one place. Waikouaiti is a small town of the East Otago region nestled on the mouth of the river sharing the same name. It was the first European settlement in Southern New Zealand to be mainly based on farming and to this day, remains the oldest European settlement of Otago. Sheep farming is the primary industry of the district and the town enjoys a very agricultural feel. Waikouaiti is also home to a safe swimming beach that attracts many visitors each day. While in town, you should also take some time to visit the Early Settlers Museum and discover the days of European settlement. Waikouaiti is the perfect place to visit to gain an insight into New Zealand's past and to discover how this beautiful country has grown and developed. Dunedin is the principal city of the Otago region and is one of the largest cities in the whole of New Zealand. The city stands on the hills and valleys surrounding the head of Otago Harbour and enjoys beautiful surroundings and views. Dunedin is a city of natural, historical, sporting and culinary treasures which gives it a rich culture and heritage that is unprecedented throughout the world. It is often referred to as the architectural heritage capital of New Zealand and lives up to its name with an abundance of stunning, old-time buildings. Dunedin is also home to the world's rarest penguin and various species of seals, sea lions and pelagic birds which give the area a special uniqueness and attractiveness. You simply must visit Dunedin and discover what all the fuss is about! Owaka is a small settlement of the Otago region of New Zealand's South Island. It is the largest community in the Forest Catlins Area, established back in the 1800's by the early pioneers. The town enjoys a close proximity to the Purakaunui Falls, Pounawea, which is a great place for bird watching, and the fur seal colony at Nuggets Point. While visiting the quiet town of Owaka you simply must take a drive out to Jack's Blowhole, where you will find a large sea cave that has collapsed to leave a deep ocean-filled hole in the middle of a field. All of these natural wonders are essentially what makes Owaka such a pleasant place to visit! Milton is the second largest town of South Otago and lies on the flood plain of the Tokomairiro River. Its earliest claim to fame was a thriving pottery industry, which produced some of the country's finest pottery collections. It is now regarded as a service town for the farming community that surrounds the area and is a pleasant community that enjoys a country town feel. Known as one of the southernmost cities in the world, Invercargill is the commercial centre of the Southland region of New Zealand's South Island. The warmth, friendliness and hospitality of this region will leave you feeling welcomed and right at home in this stunning environment. The rejuvenated city is home to and abundance of trendy cafes and restaurants, modern boutiques and shops and a multitude of nature reserves and parks. The heritage buildings in the city centre give the city a sense of character and depict the days gone by. While visiting you simply must discover the Southland Museum and Gallery and pay a visit to the roaring 40's exhibition. This will give you an in depth insight into the history of the southern landforms and show you why Invercargill is considered the gateway to the New Zealand's southern coastline. A visit to Invercargill is sure to surprise, please and intrigue you, so much so that you will never want to leave! Another highlight of the Southland region is the small country town of Winton. This friendly community is nestled close to the east bank of the Oreti River and enjoys the perks of an abundance of surrounding rivers and waterways. The town was formerly a railway junction, yet operation has ceased over the years and most of the commercial hub occurs in the one main street. The character cafes and friendly pubs, demonstrate the town's hospitality, which leaves you feeling comfortable and at home. A visit to Winton is the perfect way to catch up on a spot of fishing as the local rivers are home to an endless supply of trout. While visiting, you should also take some time to endeavour on a jet boat adventure which will introduce you to the untouched wilderness and breathtaking beauty of this stunning area. Te Anau is the hub for sightseeing activities in the Fiordland Region of New Zealand's South Island. The town is nestled on the banks of a lake sharing the same name and enjoys peaceful and tranquil surroundings. The spectacular backdrop of Mt Luxmore and the Murchison Mountains creates an ambience that leaves visitors feeling calm, cool and eager to explore the beautiful surroundings. Te Anau is known as the 'walking capital of the world' and lives up to its name, offering countless picturesque walking tracks and routes, that are suitable for any fitness level. When it comes to recreational activities, visitors can choose from taking a scenic flight, launch cruises, sea kayaking, underwater diving, cycling, fishing and many more. The relaxed atmosphere and incredible surrounds will allow for your visit here to be a pleasant one that will leave you amazed at the true beauty of nature. Milford Sound is part of New Zealand's Fiordland region is a nature wonder that you simply cannot go past. It is often described as the eighth wonder of the world and is one of the country's most famous attractions. A visit to Milford Sound is always on the itinerary of New Zealand visitors, as you simply cannot miss this stunning landscape that will absolutely take your breath away. Choose to take a day or overnight cruise on the calm inlet waters of Milford and discover the impossible high mountains, crystal clear waters and the prominent Mitre Peak. The scenery here captures the best of what this great country has to offer and is the perfect way to reconnect with nature. The city of Queenstown is surrounded by dominant, often snow capped mountains and is nestled on the shores of the crystal clear Lake Wakatipu. 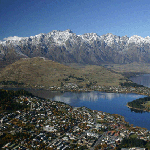 Queenstown is the premier four season lake and alpine reserve and is truly the Otago region's central highlight. The commerce oriented centre is home to fine wine and cuisine and is also the centre point of adventure in New Zealand. Known as a natural theme park, Queenstown offers an endless array of adventure activities, with something to please all ages and tastes. The unbelievably beautiful surrounds alone are enough to keep anyone happy and make you never want to leave this amazing place.